[(The) majority] is (the) LION'S SHARE. [Alarmist activity] = CRYING WOLF. [Not wanting what you can't have] is SOUR GRAPES. except that i usually think of SOUR GRAPES as disparaging something that you do want but can't have. my dictionary backs me up on this usage. not wanting what you can't have seems like a good thing, actually. [Valuable products] are GOLDEN EGGS. what do these expressions have in common? why, they're all derived from aesop's fables. the boy who cried wolf is perhaps the most famous of his stories. well, okay, the tortoise and the hare. but then the boy who cried wolf. the fox and the grapes is in there. i, uh, don't know where the lion comes in and how much his share is. and the golden eggs... i thought that was a fairy tale (grimm? mother goose? ), not an aesop fable. at any rate, the contest instructions tell us that This week's contest answer is formed by reversing one of the grid entries in today's puzzle. is there anything related to aesop in the grid backwards? why yes: the unusual partial POSE A is right in the middle of the grid at 27d, clued as [___ threat to (endanger)]. spell it backwards and what do you get? turn me on, dead man. wait, no. um, AESOP. and that's the anwser to the contest. i may have had an unusually easy time with the meta because i recently constructed a puzzle with AESOP as an answer, and leafed through the clue database to see what the various options were, and several of these featured prominently. so aesop was near the front of my brain. staying on sports, [Football announcer's phrase just after a field goal attempt has been kicked] is IT'S UP. i like this a lot. (in fact, i've used this clue before, though not in a puzzle any of you have seen, i suspect.) much better than going with a partial like ["___ to you"]. just a bit more sports: [D.C. athlete] is a georgetown HOYA. i usually don't have very specific reasons for having the favorite teams that i do, but in this case, i grew up in georgetown (as a very small child) because my mom was in school there during the patrick ewing days. so i was pretty much raised to root for them. [Word before Jamaica or Jordan] is AIR. nifty clue there, since AIR jamaica is an airline and AIR jordan is a shoe. although really, shouldn't AIR jamaica be usain bolt by now? i'm assuming you guys have all seen/heard that he ran a 9.58 in berlin. un-freaking-believable. anyway, that's a nice segue from sports to geography. [The Sahara is in it] was a devilish way to clue LAS VEGAS, since i'm often on the lookout for tricky vegas clues but i've never heard of the Sahara hotel/casino. moving to africa for reals (yo), [Nigeria's capital] is ABUJA. i always want LAGOS first, and only later do i remember that it's now moved. but LAGOS is still the largest city in nigeria and the second-largest in all of africa. speaking of second-largest cities, [South Korea's second-largest city] is PUSAN. represent! oh, and back to sports for a second. newly-crowned PGA champion y.e. yang is from cheju island, off the coast of PUSAN. 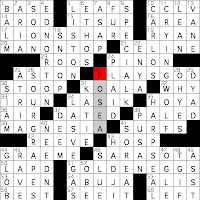 okay, slightly more sports (geez, there was a lot of sports in this puzzle, wasn't there? especially for a guy who claims he only follows "real" sports like chess): [Swinging Sonny] is boxer sonny LISTON, and his two-time opponent muhammad ali is represented by ALIS in the lower right, clued as [Tatyana and Laila]. laila, of course, is his daughter (and a boxer in her own right); tatyana played ashley on the fresh prince of bel air, and as far as i can tell, is not related to the boxing ALIS. i don't think i'd remember her except for the fact that i went to school with her. she may even have been in my year. [Makes major decisions for others] is PLAYS GOD. awesome answer. that's all for me. see you next week.